Coca-Cola is one of the best-known brands for teens worldwide, who associates the drink with having a good time. 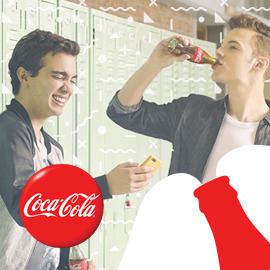 As Coca-Cola is enjoyed in all social circles and age groups, teens drink it both with their families and with their friends, as well as when they are alone with their loved ones. As a result, Coca-Cola has become more than just a soft drink, but a symbol of friendship and happiness. Create a new breakthrough packaging design for Coca-Cola can or bottle that will allow 12 to 19-year old teens express themselves. Themes to cover are either Autocracy or Freedom in doses. The entries are accepted until December 20th.